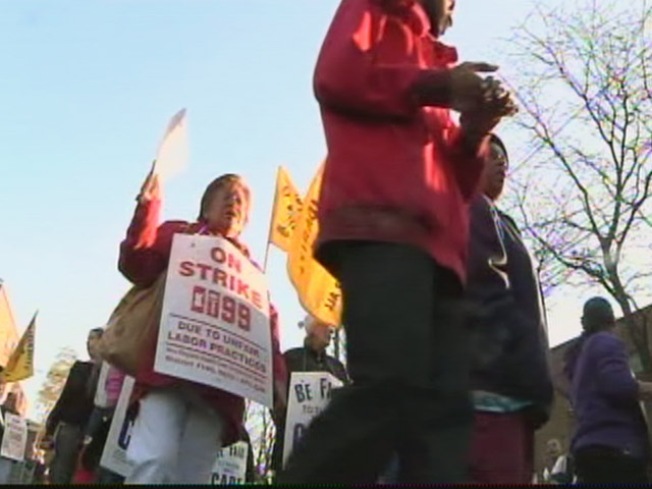 Hundreds of nursing home workers are on strike. Hundreds of Spectrum Healthcare nursing home workers from across the state are on the picket line on Thursday morning, striking over wages, working conditions and contract concerns. Union officials said Spectrum Healthcare asked the workers at its four facilities to go without a raise until next year and threatened to hire replacements if workers didn't cross the picket line. Nurses and support staff say they have been working under an old contract and they're fed up. The strike started at 6 a.m. at Park Place in Hartford, Birmingham Health Center in Derby, Hilltop Health Center in Ansonia and Laurel Hill Health Center in Winsted. Union officials also said they are concerned about health and safety records of the homes. Union officials said “all four of the Spectrum nursing homes on the strike deadline, plus a fifth home where the contract does not expire until 2011,” received letters from the U.S. Department of Labor’s Occupational Health and Safety Administration in March stating that they had illness and injury rates more than twice the national average among all U.S. workplaces. Spectrum Chief Financial Officer Sean Murphy told the Associated Press that the company has been affected by flat Medicaid funding from the state, but has offered workers wage increases, free insurance and paid pensions. Company officials also said care at the homes will not be compromised while workers strike.